Please visit our Hurricane Michael webpage for more information about our after affects from this very powerful storm. New 2018 Event Coming Soon - Please check back often and feel free to contact us to get involved! Three of rock music’s most revered front men gathered for the inaugural Rock The Kids, an exclusive evening of unplugged music at Panama City Beach’s award-winning Firefly Restaurant on May 17, 2018. Mark Slaughter of “Slaughter”, Gunnar Nelson of twin duo “Nelson” and “Mr. Big” front man Eric Martin performed an intimate in-the-round concert, with proceeds being presented to Anchorage Children’s Home in Panama City. Rendy Lovelady, Rock the Kids organizer and Pepsi Gulf Coast Jam Producer plans to make the concert an annual event in honor of his father. The event included Unplugged Performances, Silent/Live Auction, Firefly Dinner, Wine, VIP cocktail with Meet & Greet, Dinner with the Artists, Commemorative event artwork and more. We are extremely thankful to have been included in such a rockin' great time. The 16th Annual Champions for Children Golf Tournament. 16th Annual Champions for Children Golf Tournament by Tyndall Federal Credit Union and Anchorage Children's Home was a fun day on the links. A big thank you to our participants and sponsors. We are so appreciative of each of you and look forward to sharing another amazing day at Holiday Golf Club next year. The 6th Annual Anchors Away 6K and One Mile Family Run. The 6th Annual Anchors Away 6K & One Mile Family Fun run generated over $7500 in support to Anchorage programs! Thanks to Brock Lawn & Pest Control as the Presenting sponsor and everyone who makes this event a success! UPS Neighbor 2 Neighbor Program. Anchorage has partnered with United Parcel Service (UPS) for their Neighbor 2 Neighbor program collecting food donations to support homeless youth in our community. UPS drivers pick up the hosted boxes from various businesses and deliver them to Anchorage on a weekly basis. The 5th Annual Anchors Away 6K and One Mile Family Run. The 5th Annual Anchors Away 6K and One Mile Family Run was held on Saturday June 4, 2016 at the Panama City Conservation Park on Panama City Beach, Florida. We had 123 registered runners and a tremendous amount of support from local businesses & families. We are so thankful to have so much community support for this event. Thank you, Bay County! The 14th Annual Champions for Children. The 14th Annual Champions for Children was held on Saturday, November 7, 2015 at the Holiday Golf Club located at 100 Fairway BLVD on Panama City Beach, FL. The Marion G. & Barbara Nelson Family Foundation. The Marion G. & Barbara Nelson Family Foundation gifts $50,000 to the Anchorage Children’s Home. The gift will help sustain “Hidle House” an emergency shelter program serving runaway, homeless and abused teenagers ages 10-17. Anchors Away 6K Family Run. The community really came together for a fun filled day on Panama City Beach, Florida! We are truly thankful for so much support from the Bay County businesses, residents, and for so many others that traveled here to help us! Thank you! The St. Joe Community Foundation. The St. Joe Community Foundation recently awarded $15K to Anchorage Children’s Home for new windows, carpet and paint for the youth bedrooms served through the Hidle House emergency shelter and foster care group home program. Bay Health Foundation awarded Anchorage Children’s Home $60K to continue to operate the Street Outreach & Recovery Program. Lynn Haven United Methodist Church. Lynn Haven United Methodist Church donated $11,400 from their Christmas Matthew 2 project. Champions for Children Golf Tournament at Panama Country Club raised $10K for Anchorage Children’s Home in November 2014. Please visit the EVENT PAGE for more details. Happy Holidays, we hope to see you soon! Bay Health Foundation awarded Anchorage’s SOAR program a $60K grant to continue operation and advance efforts in serving homeless and runaway youth in Bay County. Anchorage celebrated with local partnering agencies along with a special visit from Esther Jacobo, Interim Secretary for the Department of Children & Families, to announce the opening of Anchorage’s newest residential program, The Sibling Group Home. Motorfest by Tricked Out Car Club. Tricked Out Car Club donated $3,200 from their October 12th Motorfest 2013 held at Spinnaker Beach Club on Panama City Beach, Florida. Lots of wonderful people, beautiful vehicles, and talented musicians came together from all over the Southeast for this annual fall festival. Friendly, Respectful & Professional is the TOCC Way! 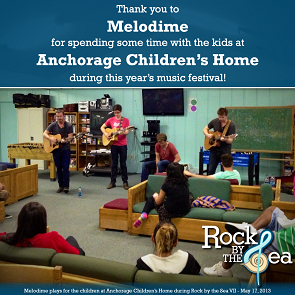 Rock by the Sea concert recently provided Anchorage with a $5000 donation from funds generated at their Spinnaker concert held in May 2013. The benefit concert also incorporates a “Rock N Roll Model” where many of the artists visit the youth shelter and share their music with the children. "The Bridge gave me a place to stay when I was left behind." "Walking in on my first day was like a thousand pounds lifted off my shoulders."